Got this popped into my inbox and wanted to share in full. And yes - I'll be there in March. Los Angeles, CA – January 11, 2016 – Meiko and Marié Digby announce today that they’ll embark on a string of U.S. tour dates together in February and March. 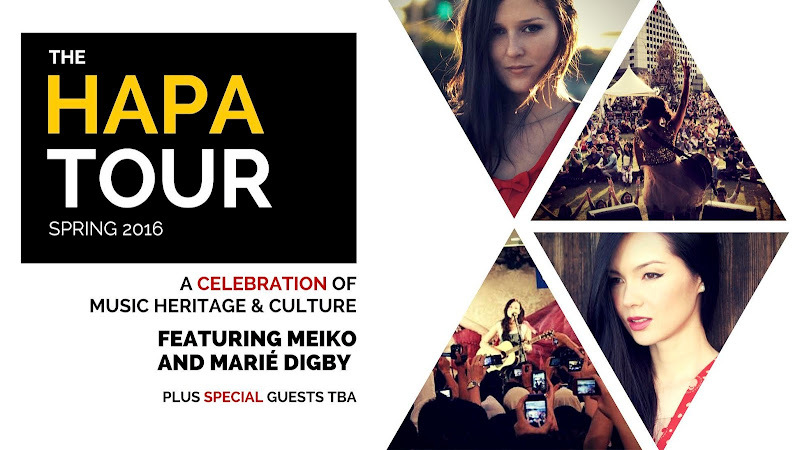 Beginning in San Diego on Feb. 24, they’ll also bring their “Hapa Tour” to Costa Mesa, Hermosa Beach, Los Angeles, San Francisco (Mill Valley), Chicago (Evanston), Marshfield, WI, and Minneapolis (dates, cities and venues are listed below). Additional shows in the northwest and northeast will be announced soon. A “Hapa” is a person of mixed racial heritage with partial roots in Asian and/or Pacific Islander ancestry. Meiko is one-quarter Japanese on her maternal grandmother’s side, and Marié’s mother is Japanese. The idea to put together a tour celebrating this heritage was the brainchild of Meiko: “My sister and I were the only part-Asian kids growing up in our small town in Georgia, so it was always awkward when people asked 'what ARE you?’ I wanted to put together a little tour celebrating ‘Hapa-ness’ and to spread the word - mainly to let kids out there know it's not weird to have parents of different ethnic backgrounds. It’s actually pretty awesome and more common than you think!" Both Meiko and Marié Digby will soon announce their plans to record new albums - stay tuned!